New Jewish year, new books by Jewish authors! 1) After being mesmerized by The World to Come and In the Image, I can’t wait to read Dara Horn’s newest, A Guide for the Perplexed, which was officially published today. An essay by the author appeared in The New York Times this week, reminding of the book’s release. The topic was the role of memory in literature — particularly in Jewish literature — which Horn tied to Rosh Hashanah. (The holiday falls later this week, and it’s also known as “The Day of Remembrance.”) Her new novel reportedly draws on this theme as it follows two contemporary characters obsessed with the work of the Rambam. 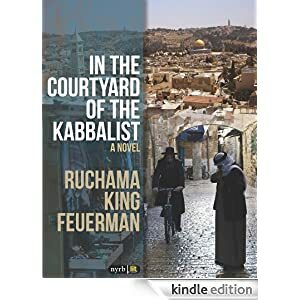 2) Ruchama King Feuerman’s In the Courtyard of the Kabbalist follows an assortment of characters in Jerusalem. I’m very blessed that the author has sent me an advance copy — a review here on the blog will be forthcoming. I was a big fan of her last book, Seven Blessings, as well as some of her more recent, shorter work. Feuerman has been called “a Jewish Jane Austen,” probably because her character portraits so marvelously balance positive and negative qualities. I’m already a few dozen pages in to the new book and really getting into it. For a recent review, see here. 3) Ofir Touche Gafla’s The World of the End will soon be published in English. I was very intrigued by an interview with the author that I recently read on the Jewish Book Council blog. A fantasy about the afterlife, the English translation will be handled by the sci-fi/fantasy imprint, Tor, known for it’s particularly sophisticated spin on the genre. Marc Lumer’s new picture book, his first as a writer and illustrator. 4) And for the kids, my colleague (and fellow Angeleno) Marc Lumer published his first picture book as an illustrator and author last week. Benny’s Mitzvah Notes will be a must-have for Jewish classroom and home. Its vibrant and humorous illustrations pair with a heartwarming story that brings meaning to “mitzvah notes” sent by parents to teachers. What books are you looking most forward to reading in 5774? Reply with the titles and authors in the comments below! ← Last chance to get a new, unpublished story from me!